As far as food preferences go, Jeff and I couldn’t be more opposite. In addition to me being vegan and him being not-vegan, but always willing-to-eat-vegan-stuff-I-make, he eats the same meals day after day, and always at the same time. I eat only when I’m hungry, no matter the time is, and like to try new things as often as possible. At my most enthusiastic, I’ve teared up over a great meal or cursed quietly after an amazing first bite. Jeff’s reaction is always more of the socially acceptable and polite variety, usually followed with a shrug and a yeah, that was good when asked. But more pronounced is our difference of opinion on spice. I love the clean burn of thai chilis, seeing a neon oil slick on top of curries and smelling the aroma of a well-balanced chili sauce wafting off a dish. But anything remotely spicy is kryptonite to Jeff, and he can detect the tiniest speck of it in anything. So when I make a dish with sriracha, sambal, thai chilis or any dried chili spices, I’m on my own. The other night, I was craving something spicy, so I made this dish. After the first bite, “fire noodles” seemed like an accurate name. Sure, there’s sambal in there, but it’s the thai chilis that make these noodles scary hot. After googling “fire noodles,” I learned that this is an actual thing, with an actual following. I have no idea how this version compares, but if you like heat, this fits the bill and can be scaled up or down to your liking. Melt the coconut oil in a small saucepan over medium-low heat. Add in the minced ginger and allow to fry for about 2 minutes. Reduce the heat to low, then add in the brown sugar and stir to coat. Add in the rice vinegar, stir, then add in the peanut butter and stir until liquefied. Add in the sambal and thai chilis (if using), stir, then pour in the coconut milk. Bring to a small simmer, stirring occasionally, then remove from the heat and cover. Combine the panko and sesame seeds in one bowl. In a separate bowl, whisk together the white rice flour and water until smooth. Preheat a cast iron pan over medium heat. Add a thin layer of oil to the bottom. Dredge the tofu in the rice flour/water mixture, then press into the panko/sesame seed mixture until evenly coated. Place into the hot pan and allow each side to become golden brown, a few minutes on each side. Remove the pan from the heat and set aside. Boil the noodles according to the package instructions. Drain, then toss them with the sauce. Transfer to serving bowls, topping with the vegetables, tofu, crushed peanuts and sliced scallions. Serve immediately. Mm, I know what I'm making for dinner! Looks amazing! I definitely need to make it after your delicious red curry and ginger noodles from yesterday! Forgot to mention in my comment on that post that I added some hot pepper to it. Do you make your sambal or buy? If so, what vegan kind do you like? Also could I sub for the rice flour? I have white flour and chickpea flour on hand but could get rice flour if this requires it. So glad I discovered your blog! So happy you liked! I use Huy Fong brand sambal (no shrimp or fish is used in it) The white rice flour gives a good "goopy" texture that allows the panko to cling to it well. If you give AP flour a try, let me know how it works … I wouldn't recommend using chickpea flour here. Thanks! I will make this as soon as I get the sambal. Will let you know if I try the AP flour. I may use a mix of cayenne & habanero from my father-in-law's plants if I can't thai chili peppers here. This is a great excuse for me to explore the local asian food store. I had a stir fry not too long ago that used 6 of those wonderful Thai bird chillies, per serving. Wow, it was hot. But so good. Shan, you can use any kind of firm tofu for this. If you are going to serve with the noodles, I recommend not marinating it. If you want to just make the tofu, you can press it, then marinate before breading it. I hope you enjoy! Amazing photos! Can't wait to try tofu like that with the panko bread crumbs. Y U M ! Thanks for this! If I don't have white rice flour, can I use AP flour instead? That would probably be fine, Jan … I hope you enjoy! 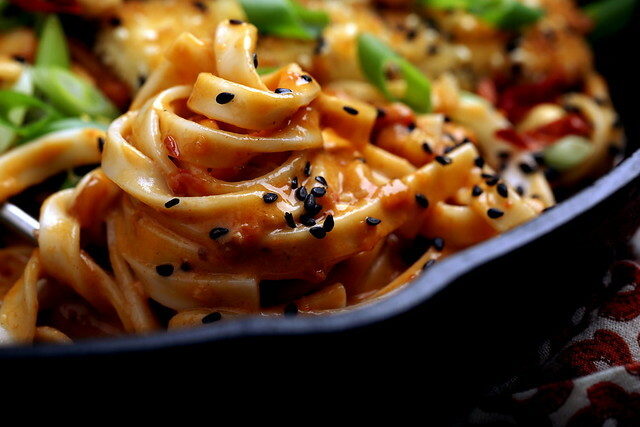 These noodles look and sound SO flavoursome & delicious.. I sure love the flavour of chilli so I definitely have to make these. I am so obsessed with this recipe. I made it at the weekend, and I'm making it again today because I need more! The first time I served it with asparagus, but today I'm going for green beans. So good! Wow. Your story sounds like my story. We should be together and they should be together. It does work out sometimes though. When we go out his meat dish comes with the vegetables that I want. Anyway, this dish looks so good. It even sounds delicious. I’m going to try it. Thanks for your recipe!